Organizing institutions: Center advanced chronic disease (ACCDiS ) in conjunction with the University of Chile, the Pontifical Catholic University of Chile, the UC Center for research in Oncology (CITO) and the Center studies molecular cell (CEMC). 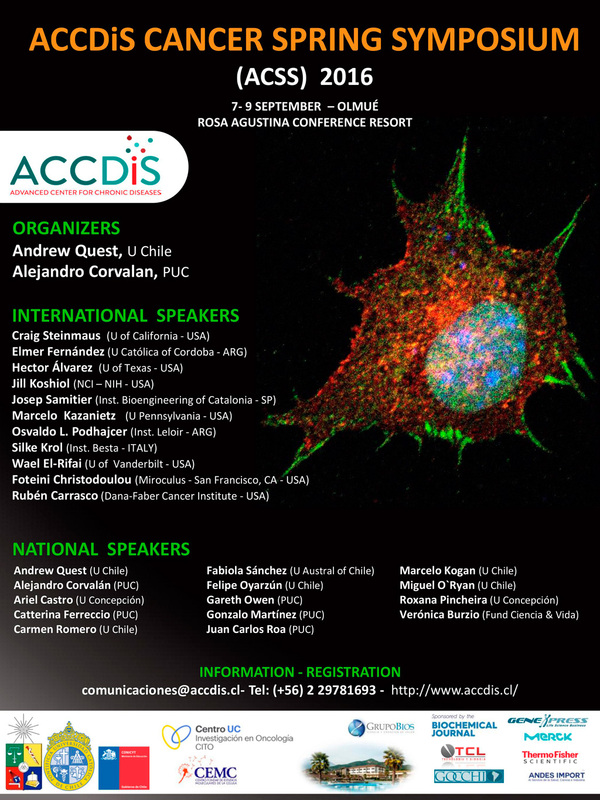 Date and place: between September 7-9, 2016, in Rosa Agustina Conference Resort, Olmué, V region, Chile. Registration and submission of abstracts: until Monday 11 July 2016, at 12:00 (noon). Response of formal acceptance of the work: from Friday 22 July 2016. Notice: Monday, July 25, date of closure for registration and abstract submission. “Instructions (ACSS), 2016 Congress Abstracts Write the summary in Word format. The abstract content and title must be in English. The title should contain no more than 700 characters including spaces. The author list should remain limited to no more than 10 authors and indicate their affiliations. The abstract body should contain no more than 1500 characters including spaces. Also, funding acknowledgements must be included within this space allocation. Nota Bene – the 1500 characters of the abstract body need NOT include title, authors and affiliations”. A. Formalizing the registration process: by entering your personal details and respective summaries in the platform available on the website of the event)WW.accdis.CL.). For questions and comments contact is to the contact communications @accdis. CL, Phone: 562 2 9781693. For registration, Click in Create new account in the image. If already has an account log for access to the platform.